Paint your own pottery in Swindon. 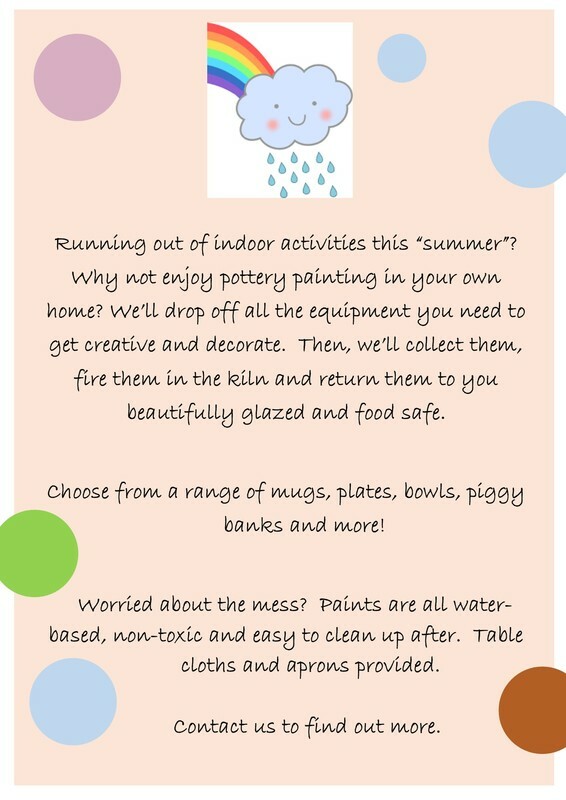 We offer children's parties, adult workshops, hand/footprints in clay, and unique party in a box offers! Dotty Pots is a mobile pottery studio covering Swindon and the surrounding area. You can host a party in your own home, or in a venue of your choice, or you can pop along to one of our drop-in events. We provide a lovely selection of blank pottery, known as bisque, for you to paint including plates, mugs, bowls, money banks, animal figurines and more! We provide everything you will need from brushes and paint to inspirational ideas! Absolutely anybody can produce beautiful pottery that will last for years to come - we are happy to teach you simple techniques that will make your pieces look amazing. You may be surprised to see what you can achieve! Once you have painted your items, we take them away to glaze and fire them in a kiln for a wonderful, hard-wearing finish. The firing process is delicate and takes a little while. You can then collect your item from a pre-arranged collection point or we can deliver/post them safely to you. Please contact us to arrange your own event!